Feb-05-12 positionalgenius: Nice to see Adams play well again. I agree with that, Mickey might have a bad tournament now and then, but he is a great player ... and I am a fan of this player. IF YOU ARE A GM ... and someone approaches you ... and says: "Do you want to play my super-computer?" (Hydra) ... I think the wise answer is, "Gee! No thanks!!!" Ladolcevita: I just saw a recent live rating chart of top female players in a Chinese chess forum,and I found it really noteworthy that nearly all the female participants in Gibraltar Masters have picked up substantial points(Judit was like one point down,but it is only natural for she's already over 2700,thus less rating benefit compared with other female players). And also my congrats to Short and Yifan!Brilliant performance! Feb-06-12 The17thPawn: I wonder what Nigel's live rating is after this brilliant result? Nigel Short was rated 2677. He gained 20 Elo points from gibralter, so moves to 2697. Dec-27-12 waustad: With 5 2700+ players this year, Short may find it difficult to repeat, since he is the 9th highest rated player. 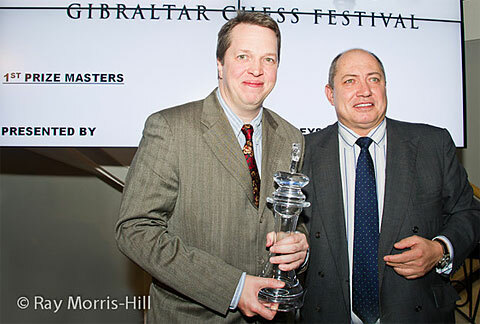 Here is the list of players for the 2013 edition: http://www.gibraltarchesscongress.c... It promises to be a fun event to watch. Dec-27-12 Blunderdome: I hope they are still adding players. Yifan isn't signed up yet. Yifan plays in Wijk A in 2013. Assuming she can't be in two places at the same time, she won't play Tradewise in 2013. Wijk starts January 12th and lasts till January 27th. Tradewise Gibraltar starts January 20th and ends January 31st. perfidious: Maybe they'll add <Blunderdome> to Tradewise. perfidious: <Blunderdome> But which section? That is the question which has plagued the sages of the ages. Dec-28-12 Blunderdome: I always thought there should be a "perfidious" section. I'd play in that one. Dec-28-12 waustad: Yes, I'm looking to travel during a Tata rest day before Gibtel starts. I haven't tried following European chess from the West Coast much. I may just see games later more than usual. I may also just say &%$# it and go walk around because it isn't snowing/cold/ugly out.